Banks are financial institutions that are engaged principally in the business of money lending and money borrowing. The customer base of the banking sector is very large and there is also a substantial risk involved in lending money. While the bank always has the option of taking legal action on the defaulting borrowers, it is not always economically feasible to do so. The bank sometimes decides to just cut its losses, clean up its balance sheet and keep the business moving towards better avenues. This is where an asset reconstruction company comes in. What is an Asset Reconstruction Company? How will the ARC carry out the process of asset reconstruction? What type of debts can the ARC take over? An asset reconstruction company is a special type of financial institution that buys the debtors of the bank at a mutually agreed value and attempts to recover the debts or associated securities by itself. The asset reconstruction companies or ARCs are registered under the RBI and regulated under the Securitisation and Reconstruction of Financial Assets and Enforcement of Securities Interest Act, 2002 (SARFAESI Act, 2002). 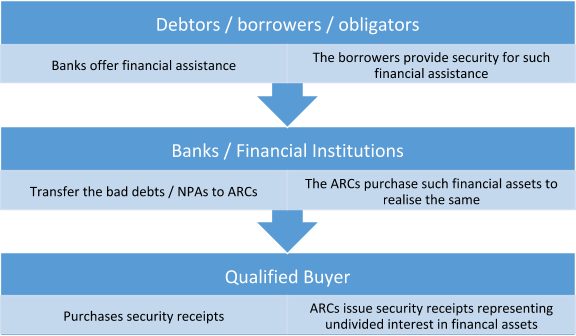 The ARCs take over a portion of the debts of the bank that qualify to be recognised as Non-Performing Assets. Thus ARCs are engaged in the business of asset reconstruction or securitisation or both. All the rights that were held by the lender (the bank) in respect of the debt would be transferred to the ARC. The required funds to purchase such such debts can be raised from Qualified Buyers. It is the acquisition of any right or interest of any bank or financial institution in loans, advances granted, debentures, bonds, guarantees or any other credit facility extended by banks for the purpose of its realisation. Such loans, advances, bonds, guarantees and other credit facilities are together known by a term – ‘financial assistance’. It is the acquisition of financial assets either by way of issuing security receipts to Qualified Buyers or any other means. Such security receipts would represent an undivided interest in the financial assets. Qualified Buyers include Financial Institutions, Insurance companies, Banks, State Financial Corporations, State Industrial Development Corporations, trustee or ARCs registered under SARFAESI and Asset Management Companies registered under SEBI that invest on behalf of mutual funds, pension funds, FIIs, etc. The Qualified Buyers (QBs) are the only persons from whom the ARC can raise funds. The business of asset reconstruction or securitisation may be commenced only after obtaining a registration certificate under Section 3 of the SARFAESI Act, 2002. The main requirement in this regard is that the ‘net owned funds’ as prescribed in the RBI Act should be Rs. 100 crore or more. Rescheduling the payment of debts – offering alternative schemes, arrangements for the payment of the same. The ARC can take over only secured debts which have been classified as a non-performing asset (NPA). In case debentures / bonds remain unpaid, the beneficiary of the securities is required to give a notice of 90 days before it qualifies to be taken over. The criteria for the classification into such categories depends upon the type of financial institution and the regulatory authority governing such bank or financial institution. Out of the above 4 categories, a non-performing asset would be either a sub-standard, doubtful or a loss asset.